I just got back from serving with LiveBeyond in Thomazeau, Haiti, where poverty, starvation, sickness and Satan can be seen at every corner. While I was still processing this level of hurt and pain, I came home to the injustice of the Orlando shooting. Hurt has so many different faces. Hurt looks like scrubbing a tiny Haitian head that is covered in ringworm. Hurt looks like hundreds of people mourning the loss of loved ones to gunshots. Hurt looks like students feeling unsafe at their schools because of bullies. Hurt looks like shoeless feet traveling miles to receive medical care. Hurt looks like a nation crying out after acts of hate and prejudice. Hurt looks like a teenager struggling after his parents go through a painful divorce. Hurt can be overwhelming and sometimes it is easier to do nothing rather than wade into the unknown of pain. However, if there is anything that I have learned while in Haiti, it is that we cannot simply sit back and stay quiet. If not us, then who? But where do we start? How can I help people that are miles, states or even nations away? Focus on the person in front of you. Are you far away from Orlando or Haiti? Unless you have time off and money for a plane ticket, that is probably not going to change, but you can love on that neighbor who is also struggling. Or you can tell a friend who feels targeted how sorry you are. You can take food to someone who has recently experienced loss, or volunteer with a local organization. When there is a tragedy or when the hurt and pain is too overwhelming, start by loving the person directly in front of you. Don’t freeze. Don’t turn around and run. By focusing on one person at a time, you are making a difference in a manageable way! Once you have made that person in front of you feel loved and heard, move on to another person and do the same for them! Find ways to encourage from afar. Spend time in prayer for those that are hurting. For example, print off the names of those who died in Orlando – spend time specifically praying for their families by name. Send letters, Facebook messages or care packages. Find those who are affected or maybe those who are living in areas where they are interacting with hurting people and encourage them with words and thoughtful gestures! Support organizations who are helping those in need. 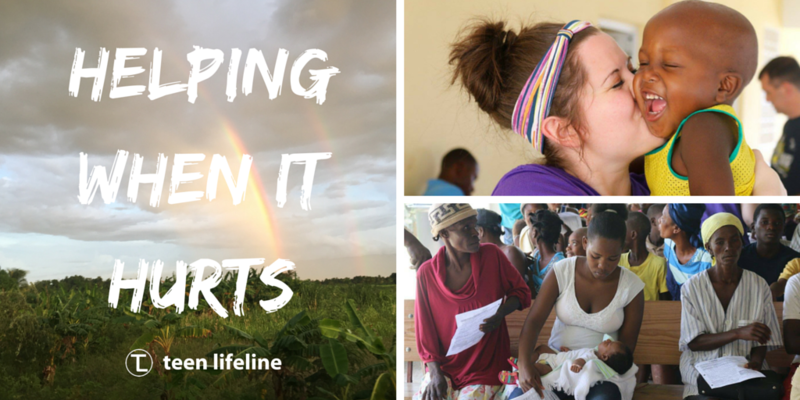 Even if you only have $10 a month, you can partner with an organization and make a difference in the lives of those who are hurting. Take up the cause of the oppressed. Since I am a Christian, the message of this verse is very clear – if I want to know God, it is my job to defend the poor and needy. If you are not motivated by Christianity or a sense of higher calling, you can still stand in the gap for those who have no one else to defend them or speak on their behalf. This does not mean that you need to go on a 2,000 word Facebook rant to shame those who act out in hate, but instead think about how you can offer your thoughts, prayers and encouragement in a short, positive post. Maybe defending their cause means bringing hope and understanding into a conversation of condemnation. For me, it means talking about the organizations and people I love (like Teen Lifeline & LiveBeyond) whenever possible. I can share the struggles and challenges of teenagers and the people of Haiti. I can bring awareness and recruit others to join their cause. So, I am asking you to join me. Let’s not sit by and retreat in times of pain! Instead, let’s try to help in the midst of hurt. Do you have any other ideas of how to help in times of pain and hurt? We would love to hear them!